Excel Derivatives Analysis (FinOptions) provides a library of detailed and flexible financial functions with Excel dedicated to options pricing, derivative modeling and analysis. 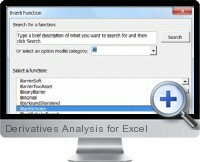 Derivatives and options functions can be easily accessed from a custom toolbar categorizing model types and including context search to isolate the optimal solution. Extensive help information together with prebuilt examples of all derivative modelling components accelerate the development and analysis of complex option pricing and derivative based financial instruments. Financial derivative can be reverse engineered by understanding the component dependencies and valued using already established real time data feeds in Excel. Option sensitivities calculate and update to underlying data including delta, gamma, theta, vega, rho, psi, lambda and volatility. Vanilla Options include Black-Scholes, Modified Black-Scholes, Black, Whaley, Eurodollar, Black-Scholes French, Jump Diffusion, Bjerksund-Stensland, Roll-Geske-Whaley, Cox-Ross-Rubinstein/Hull Binomial, and Monte Carlo based derivatives. Exotic Options include Asian Options with Average Price/Average Strike/Asian Monte Carlo/Asian Spread Monte Carlo, Barrier Options, Single Single Trinomial, Double, Lookback, Partial Start, Partial End, Soft, Partial Two Asset, Two Asset, Binary Options, Asset or Nothing, Cash or Nothing, Two Asset Cash or Nothing, Gap, Supershare, Binary Barrier and Currency Translated Options, Equity Linked Foreign Exchange, Foreign Equity, Quanto, Takeover Foreign Exchange, Extreme Spread, Fixed Strike Lookback, Partial Fixed Lookback, Partial Float Lookback, Lookback Monte Carlo, Multiple Asset Options, Dual Strike, Exchange, Exchange Binomial, Exchange on Exchange, Portfolio, Rainbow, Rainbow Binomial, Spread, Spread Binomial, Two Asset Correlation, Multiple Exercise Options, Complex Chooser, Compound, Compound Binomial, Executive, Forward Start, Time Switch, Writer Extendible and Spread Binomial derivatives. Interest Rate Options include Futures, Bonds, Bond Options, Cap/Floor and Swapation option models. Additional analytical utilities include historic volatility calculation under various High-Low-Open-Close combinations, Linear and Cubic Spline interpolation algorithms.